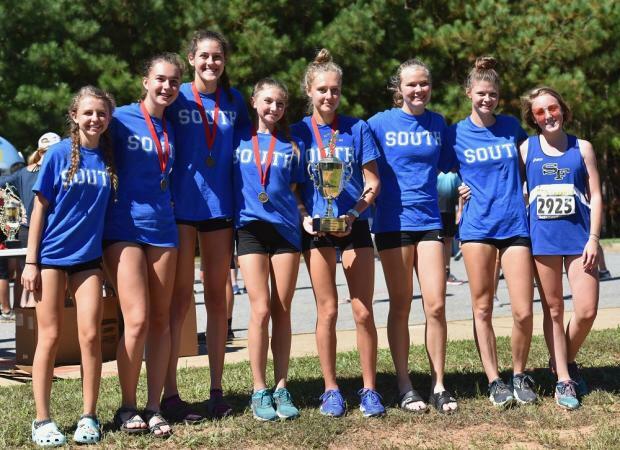 In very hot & humid conditions, South Forsyth showed it strength by winning both varsity & JV races on their way to capturing the Eagle Cup at the Milton Cross Country Invitational. Cambridge, Milton, South Forsyth & Blessed Trinity waged battle on the very tough Milton home course and after the dust settled, South Forsyth (1st-48 pts) prevailed over a rallying Milton (2nd-66 pts) squad just edging Blessed Trinity (3rd-74 pts). Lambert (4th-103 pts) surprised a depleted Cambridge (5th-117 pts) team that was missing two of their top-5 runners. 14 teams scored. The hilly course still yielded some strong performances and good races. Cambridge junior Ashley Sechrest (1st-20:24) just missed making the top-10 performers on the course by less than 2-seconds. Sechrest took command just past the mile and ran alone all the way to the victory! 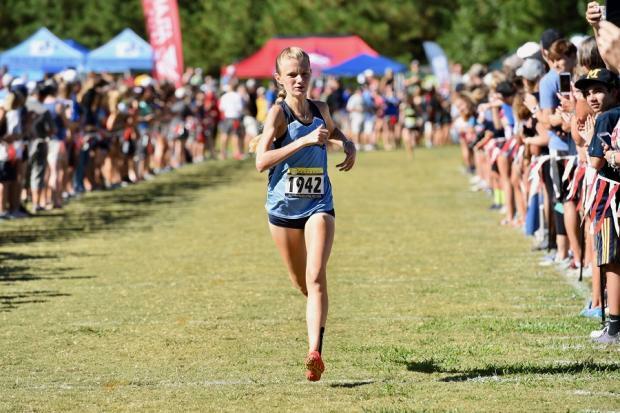 The race for runner-up honors came to the wire, as South Forsyth junior Madelynne Cadeau (2nd-20:33) just edged out sophomore Hannah Miniutti (3rd-20:34) of Blessed Trinity to lead South Forsyth to the overall win. Milton countered with junior Abby Rindt (4th-21:02) & senior Taylor Cushman (5th-21:08) both running course personal bests to lead the Lady Eagles to a runner-up finish. The team race became a battle of attrition as the heat and humidity hit the race hard as the varsity boys were the last race of the meet. The War Eagles of South Forsyth (1st-65 pts) prevailed, running a strong team race with a very small spread between their scorers. Cambridge (2nd-99 pts) packed it in with their #3-5 runners to turn back Lakeside-Evans (3rd-110 pts) and host Milton (4th-125 pts). 17 complete teams scored in the race. 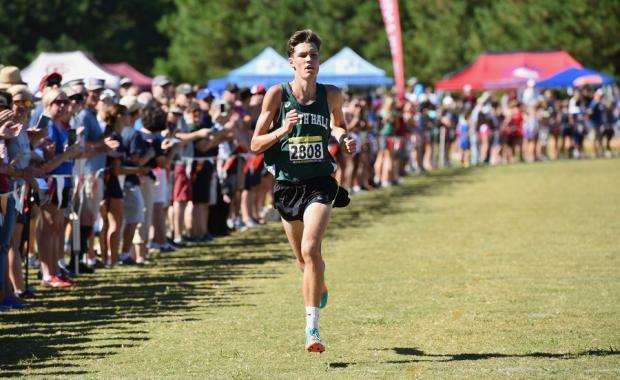 Defending 3A state champion Devan Crow (1st-16:42) of North Hall took command just past the 3k mark to capture the meet win by 19-seconds and his performance is only the 3rd time anyone had run sub-17:00 on the Milton course. Crow's performance only trails Sam Bowers (16:19) & Nicholas Yanek (16:23) of Milton on the all-time performers list for the course (same course since 2007). John Higinbotham (2nd-17:01) of Veritas Classical School closed well to become the 4th fastest performer ever on the course! But the fast running did not stop there. 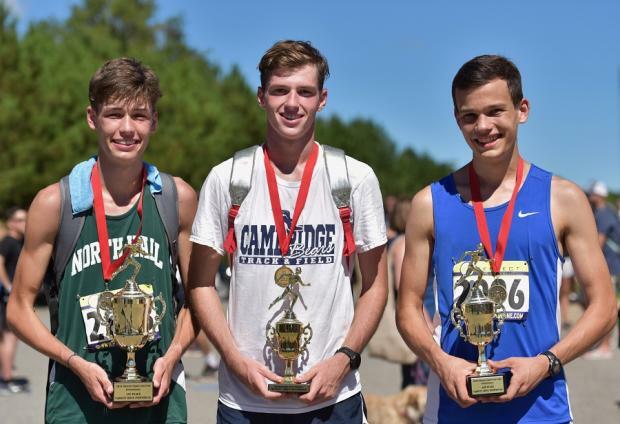 On a very hot & humid day, the course yielded the 5th & 7th best performers of all time with seniors Jack Filan (3rd-17:04) of Cambridge and Mark White (4th-17:14) of Lakeside-Evans! With these performances, Dru Milton (Milton), Zach Morgan (Cambridge) & Sid Vaughn (Lakeside-Evans) drop-off the all-time course performers list! WOW! South Forsyth (1st-16 pts) used team race wins in BOTH Varsity races & BOTH JV races to surpass host Milton (2nd-9 pts) to capture the Eagle Cup. The host Eagles captured double team wins in the open boys & girls races to garner runner-up honors. South Forsyth will be added to the trophy to join Marist (1st-2007) & Milton (1st 2008-2011) as the Cup champions. 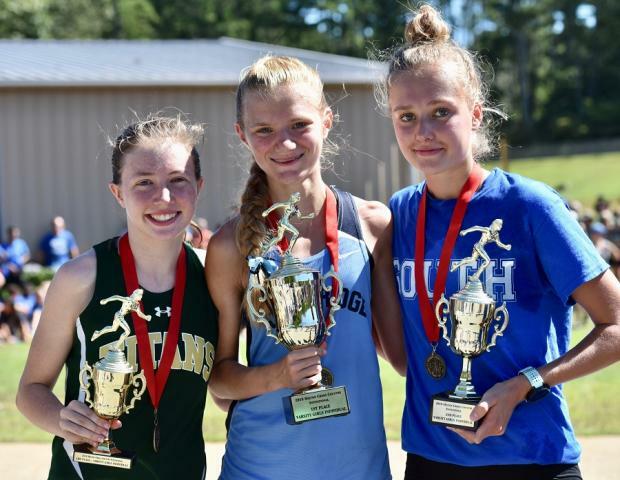 Seven school programs scored in the this year's Eagle Cup competition which includes points for top-team finishes in the Open, JV & Varsity boys & girls races that were contested.